Why Royal Partners? We're good at what we do. We're fast, competent and creative. Together we will make sure that you get the most out of your traffic. Three different commission structures. Tested, top marketing conversion tools. No negative carryover. High conversion and even better retention. There is no reason to wait - Sign up now and start making money with our solid and easy to manage affiliate program! The Revenue Share model allows you to profit for a long time after you refer a player to our brands. You earn a percentage of the Net Revenues generated by your referred players. 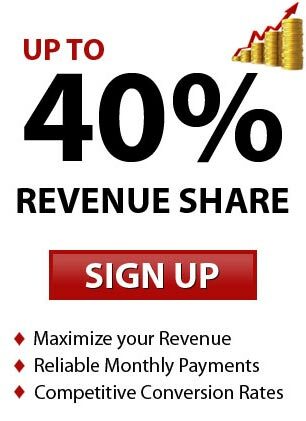 The higher the monthly Net Revenue, the higher the percentage of your earnings! With a lifetime commission of up to 40% and no negative carryover our revenue share program is easily amongst the best gambling affiliate programs. We offer the best CPA deals to our online gambling affiliates. We pay you a flat rate for every player that you refer to us directly via your campaigns. The more players you refer, the higher the payment per player! Choosing this commission model will maximize your short term income. The hybrid commission model is a cross between CPA and Revenue Share and enables casino affiliates to get an upfront payment without giving up long term profits. Hybrid deals are highly flexible and combine the best of both worlds. Affiliates interested in Hybrid deals are advised to contact their affiliate manager after joining our network in order to negotiate a Hybrid deal.